In my Yin Yoga teacher training, we were taught that kidney chi is the home of fear but also the seat of great wisdom. 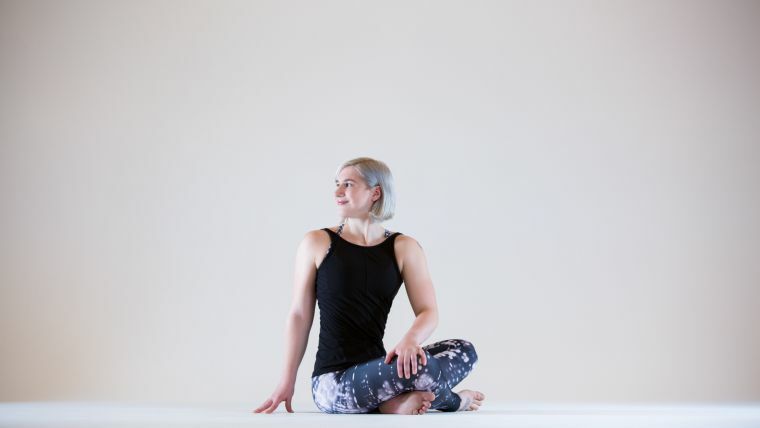 (Chi, in Traditional Chinese Medicine, the philosophy on which Yin Yoga is based, is vital energy that flows along pathways in the body known as meridians.) Being able to identify, investigate, and sit with fears can lead to a surge of wisdom. In our modern society, fear has many disguises. Some people may not identify strongly with the word fear, but they may relate to one or more of its manifestations: feelings of anxiety, a loss of personal power, or feeling generally devoid of incentive and endurance. Being able to realize and explore any of these conditions can help us to address fear and potentially lead to the wisdom that is present as well. The one-hour Yin Yoga sequence that follows is designed to balance kidney chi. In looking to target a possible imbalance of kidney chi, it is necessary to look at its pathway. Kidney chi and its associated pathway are said to relate to the health of the low back, adrenals, bones, and joints. The main part of the kidney meridian that we can target with our Yin Yoga practice travels up the inside of the leg and into the tailbone and then up the spine. 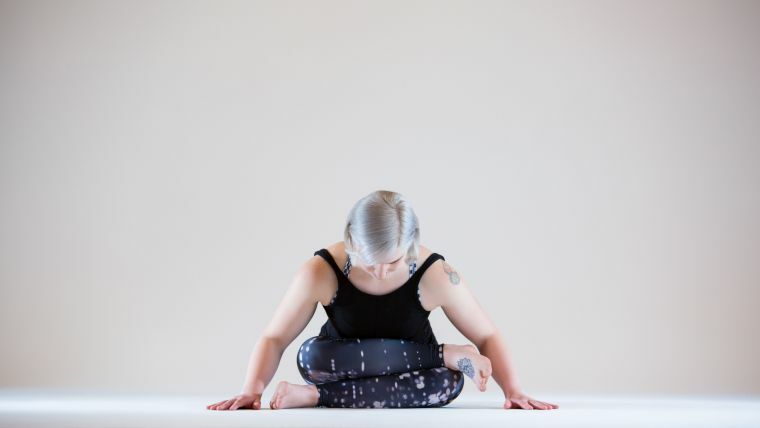 Therefore, in a Yin practice that is focused on the kidney meridian (such as the one below), many of the poses will specifically tug and gently pressurize the connective tissue in the groin and lower back (where the meridian passes through). 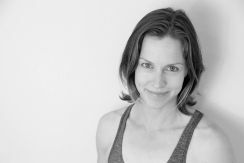 In addition to working with chi, the practice of Yin Yoga can be calming, soothing, and contemplative. It encourages non-striving, which makes it a particularly lovely practice to try if you’re feeling anxious, stressed, or depleted. As you practice this sequence, visualize a coin, with one side representing fear and the other wisdom. Resolve to metaphorically turn the coin so that the wisdom side faces up every single day. Sit and notice the sensations of your breath, the temperature of the air around you, the way your clothes feel on your body. Become aware of the breath without trying to manipulate it. 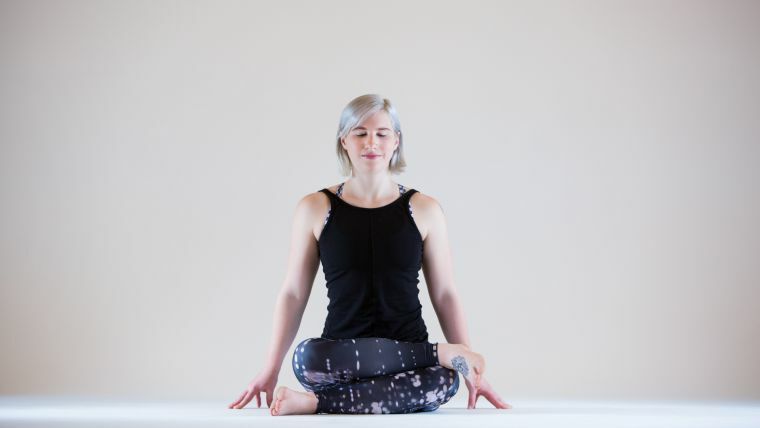 Move into butterfly (a wide bound angle pose): Your heels should be one to two feet away from your groins, so that your legs make a diamond shape, and you can place just your sitting bones on a bolster or folded blanket if your lower back rounds. Your arms are soft and hands can be on the floor or legs. If you have found your edge in this position, or if spinal flexion is contraindicated for you, stay here and breathe. If not, tilt your pelvis forward (anteriorly) and fold over your legs. Walk your fingertips forward on the floor. Let the weight of your arms softly draw your body further into the fold until you find your edge, and then allow the spine to round. 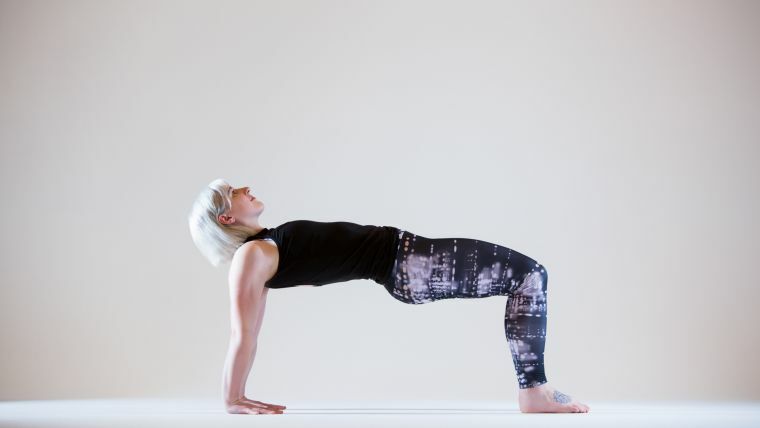 To come out of the pose, slowly rise up as you walk your hands back toward your body. 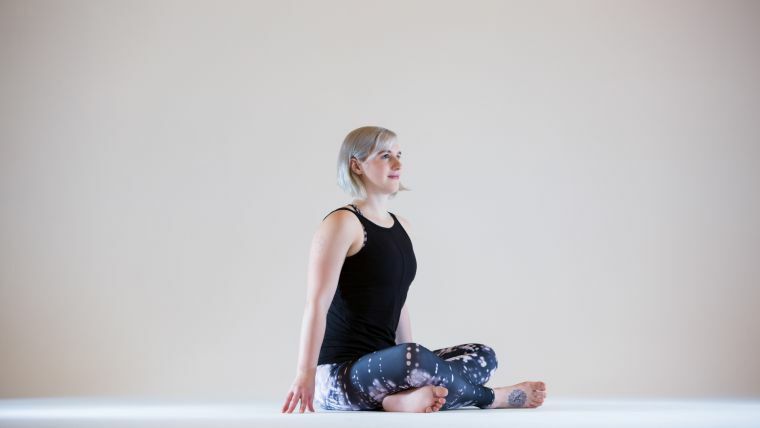 Move your legs into a comfortable seated position like sukhasana (easy pose). Twist to the right for one minute and to the left for one minute. From sukhasana, draw your right heel closer to your groins and extend your left leg out to the side. Fold forward down an imaginary midline between your legs, allowing your spine to round if appropriate. If flexion of the spine is contraindicated for you, keep your spine extended as you hinge forward only slightly. To come out of the pose, slowly unfurl the spine. Place your hands about half a foot behind your hips and lean back into them. Lift your heart to the sky in a gentle backbend for one minute. Repeat half butterfly on the other side. Come onto your hands and knees. Walk your hands as far forward as possible while continuing to keep your hips stacked right over your knees. Press your fingertips into the mat to make “cupcake fingers,” with your tented hands protecting the imaginary frosting. Let your heart melt toward the mat. Your forehead can rest on the mat or a block if that feels right for your body. Or there is the option to keep the head lifted, neck in line with the rest of the spine. If your shoulders are tight, try taking your hands wider. You could also extend only one arm, bending the other at the elbow and resting your forehead on that forearm, switching after a minute and a half on each side. If both arms are extended, hold for three minutes, and then sink back into child’s pose for one minute. From child’s pose, make your way into a comfortable cross-legged seated position. Then adjust your shins so that they are as parallel to the top edge of your mat, as is comfortable for you. See if you can tighten up the cross of your legs while maintaining a right angle in the knees. The goal is to feel a stretch in your hips, not in your knees. If your knees are okay with the movement so far, you can try placing one shin on top of the other so that ankles and knees are stacked—making a square shape, just as in the yang pose double pigeon, aka fire log pose. There can be a slight flexion in the ankle. If your top knee is way off the floor, you can place a blanket or bolster underneath for support. If it's appropriate for you and feels good, feel free to fold forward, which will stimulate the urinary bladder meridian. The urinary bladder meridian is paired with the kidney meridian, and it can be useful to target them together. After four minutes, uncross your legs, place the soles of your feet on the floor under your knees and your hands half a foot behind your hips (fingers pointing toward the body), and lift up into reverse table. Move in any direction that feels good here for one minute, and then repeat square fold on the opposite side. From reverse table, lower your hips, back, shoulders, and head to the floor. Keeping your knees bent, draw them into your chest. Reach for the backs of your thighs, your ankles, or the inner or outer edges of your feet. Take the knees wider than your torso but keep the big toes touching and your heels close to your sit bones. You can remain here, or if possible, start to take your feet away from each other, so that your shins are parallel to each other. Maintain the intention of directing the soles of the feet parallel to the ceiling, and gently draw your knees to the floor. You can either reach the tailbone toward the floor or allow it to lift up off the ground. Keep your shoulders and neck soft. After five minutes, keeping your knees bent, release your feet to the floor, taking them mat-width apart. Gently drop your knees to one side then the other, windshield-wipering them for one minute. From windshield wipers, extend your legs out onto your mat. Lift your right leg up so that there’s a 90-degree angle in your hip and your foot is reaching toward the ceiling. Let your right leg fall across your body to the left, until the big-toe edge of your right foot rests on the floor, and you’re pretty much lying on the left side of your body. Bend your left elbow and prop your head up on your left hand. Bend your left knee and catch your left foot with your right hand. Ideally, your left thigh will be facing into the floor. Stay for one minute, pulling the foot toward your left glute. Then release your left foot to the floor and inch your left thigh farther back; allow your right knee to bend. Extend your left arm and, arching back slightly, release your head and shoulders to the floor and look over your right shoulder. This pose has now become a gentle backbend and reclining twist, which stimulates the kidney meridian even more. Hold for four minutes and then switch sides. Finish with knees to chest for one minute. Fear and anxiety can be powerful emotions. The flip side of that coin is wisdom, which can be used to look at fear and anxiety. When we adjust our focus we can often see where these emotions are coming from and gain clarity about how to best address the issues that accompany them.